Federation Council approves jail terms for insulting religion | Russian Legal Information Agency (RAPSI). St. Petersburg, June 26 (RAPSI) - The Federation Council, Russia's upper house of parliament, has approved a bill introducing criminal liability for insulting the feelings of religious devotees, stipulating a punishment of up to three years behind bars. The document implies a new edition of the Criminal Code's Article 148 (Violations of the Right to Freedom of Conscience and Religion). The proposed forms of punishment for public actions that are openly disrespectful to society and offensive to the feelings of believers, including actions undertaken at sacred sites, places of prayer and other religious rites, include up to three years in prison, fines of up to 500,000 rubles ($15,510) and compulsory and correctional labor. A harsher punishment is stipulated for preventing the operation of religious organizations or religious rites. The fine will increase from 80,000 rubles ($2,480) to 300,000 rubles ($9,305). The possibility of arrest for up to three months has been affirmed. An even harsher punishment is implied for actions performed through the abuse of an official position or violence, or the threat of violence, with up to one year in jail and the deprivation of the right to hold certain positions and to perform certain activities for up to two years. Fines for violating the legislation on the freedom of conscience and worship and religious associations will increase to 100,000 rubles ($3,100). The deliberate public desecration of religious or theological literature or elements of religious service, and their spoilage or destruction, will be punishable with fines of up to 200,000 rubles ($6,200). If signed by the president, the law will come into effect on July 1, 2013. 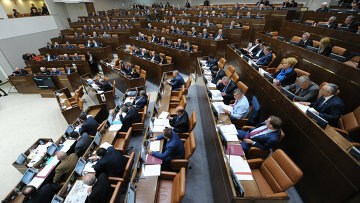 17:46 26/06/2013 The Federation Council, Russia's upper house of parliament, has approved a bill introducing criminal liability for insulting the feelings of religious devotees, stipulating a punishment of up to three years behind bars.